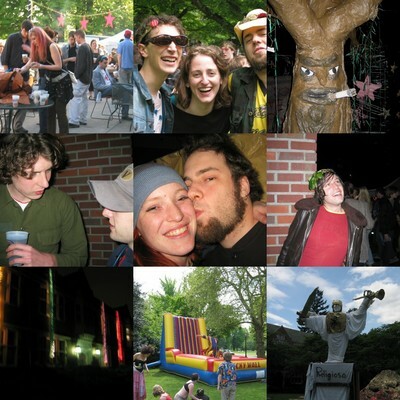 Hey Gemma, it sounds like Renn Fayre was a really good time. I am glad that you were able to go back for it and that you had a good time. I wish I could have joined you, but I suppose that I can at least enjoy the idea of Renn Fayre that I have in my head that is just crazy and awesome. I just found out that I was accepted for both of the media head positions that I applied for in the coming year. This means that I will be in charge of both the Grinnell Review (our literary and art magazine) and the Cyclone (our photo/yearbook). I am super excited about both. Although I think I am going to have to take three classes instead of four in order to keep up with things. Also, the student cookbook that I have been working on this semester is going to be printed this coming weekend! I will hold onto a copy for you if you would like. Renn Fayre was fun. I wish you could have been there. Maybe next year if I go, but I bet your finals will conflict again. .
Congratulations on your positions! That is fantastic. I know you will do a great job with them. I think it might be very wise to tone down your class load though. I would very much love a copy of the cookbook. Thanks Evan! I can't wait to see you. All my love! wanted to thank you for the shout-out. i'm really touched. i'm glad you posted some pictures and accounts of renn fayre. that one of denvy is classic drunken dan. i'm impressed they got aesop rock, and i'm glad the black peppercorns got to play again. i'll be moving back to portland in early august, i really hope you can visit. Now I know everything. I'm glad you were able to go and enjoy Renn Faire again. Should I be concerned about anything?? Oh! I would love to visit, I don't know where they money would come from though. It would be so nice to see you though. . .
Hi Mom, no need to worry, I was one of the more responsible ones there if you can believe it.